Part of the show Was Swine 'Flu Man-Made? There are a variety of ways of finding this out, but seeing as I have a high speed camera which can take video at 300 frames per second it made sense to try and use it. The only problem is that a sneeze is often mostly made up of fast moving air, which is not very visible. So I made sure that I sneezed with a mouth that was significantly wet, so plenty of visible water droplets will be thrown out with the sneeze. 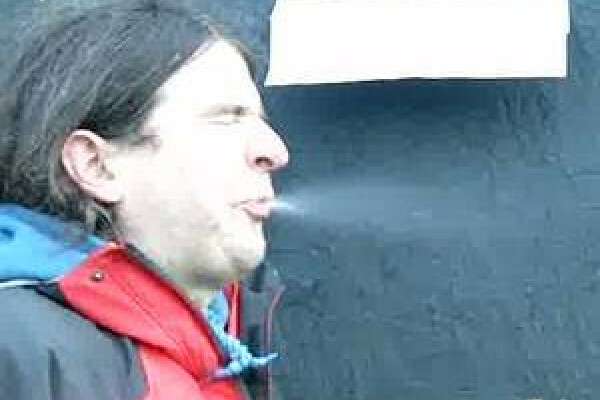 The second problem was how to trigger a sneeze - it turns out that the major effect of the traditional sneeze inducing material - pepper - seems to be to make your nose hurt, but we persevered and eventually managed to video a couple of sneezes. The piece of paper in the background is standard A4 so 298mm long. The video is running at 300fps, so if we look at individual frames we can work out how fast the sneeze is going. In 3 frames, so in 1/100th of a second the sneeze moves about 30cm. So 30m/s or 108km/hr. Why are sneezes so violent? You sneeze in order to get rid of irritants in your lungs and nose, so if you inhale some very small irritating particles, you sneeze and throw them out of your respiratory system. Some iruses have taken advantage of this reaction as a way of distributing themselves, so they irritate your lungs you sneeze and distribute them in the fine mist of spit which is thrown out.